Consumers can place preorders for the Note 7 tomorrow, and it is expected to ship in the United States on August 19, according to Samsung. Pricing will vary by carrier or retailer. Various rumors regarding the new Note have surfaced during the past few months, and though some proved true, Samsung was able to keep a few surprises under wraps. I spent about an hour with the new device last week at an exclusive briefing for the business media, and though that's hardly enough time to provide any sort of informed review, seven things about the Galaxy Note 7 stand out. 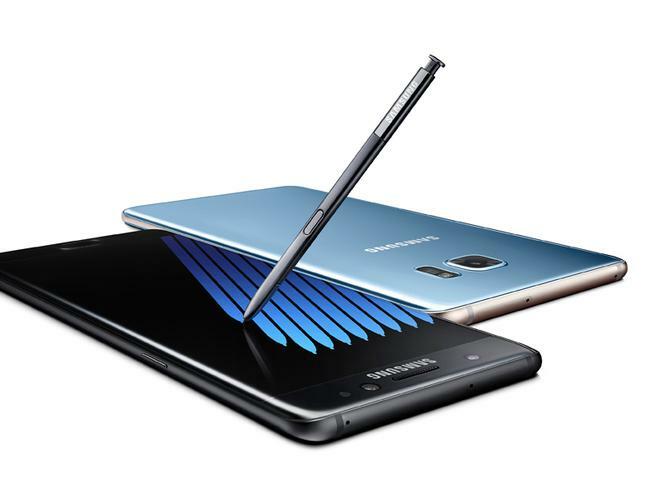 One of the Note series' defining features, its "S Pen" stylus, received a significant upgrade along with the Note 7. The S Pen is now just as water and dust resistant as the phone itself. The past couple of Galaxy S and Note phones have had water and dust protection ratings of IP68, which means the devices are "completely protected against dust, and [are] water-resistant in up to five feet of water for up to 30 minutes," according to Samsung. But now the S Pen is also protected, and that means you can write on-screen in the rain or even while the device is submerged in liquid. I tested the feature in a small basin of water, and it worked well. The design of the S Pen is also slightly different, with the "Air Command" actions button higher up on the pen. Its pressure-sensitive tip is slightly smaller and more precise, according to Samsung. And it's supposed to feel even more like a traditional ballpoint pen, for an improved writing experience. You cannot insert the S Pen into its storage slot upside down. The Note 5 can be irreparably damaged if its stylus is forced into the slot backwards, but Samsung fixed this design flaw with the Note 7. One of the most frequently rumored features ahead of the official Note 7 announcement was a new iris scanner for secure authentication. The related rumblings proved to be grounded in fact. The new Note 7 does indeed have an iris scanner, and it uses a dedicated, front-facing infrared (IR) camera to capture and scan your eyes for authentication. The iris scanner works similarly to the fingerprint reader. You walk through a quick tutorial to scan and store your iris information, which is kept in the same secure element as fingerprint scans. To unlock your phone with an iris, you simply swipe a finger to trigger the IR camera, then quickly stare at a blinking red light. I wasn't able to test the feature myself, but the Samsung representative who demoed it had no problems repeatedly unlocking his Note 7 with an iris scan. Samsung says the iris scan is an even more secure biometric than a fingerprint, because it's a more complex reading and harder to fake. From an IT perspective, Samsung says organizations shouldn't hesitate to use the iris scanner, because it adds an extra layer of security. However, the feature can be disabled via MDM policies if a company wants to block the iris scanner. The new Note also has a new "secure folder" feature that lets you create a locked "container" on your phones that can't be accessed without authentication. It's essentially a more consumer-friendly version of Samsung's My Knox personal container feature. You can also choose to hide the secure folder, so the only way it can be accessed is by drilling down into the secure folder settings. IT departments cannot disable this secure folder, but security-conscious organizations could choose to run the Note 7 in "container only" mode, according to Samsung. That would block the use of the secure folder, because the device can't run a secure container within another container. 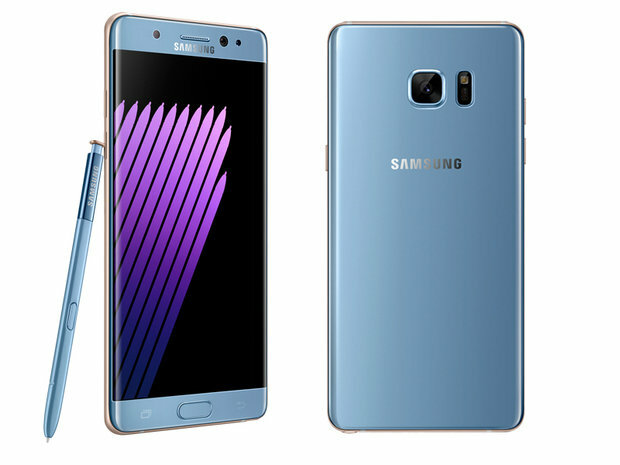 The new Note 7 phone's display is curved, just like the GS7 edge, and it has the same set of edge features. The curved displays on Samsung's phones are designed to provide quick access to information, apps and contacts. You can slide a thumb from the outside of the screen in to pull up an edge panel, which lets you view two side-by-side columns of apps or contacts. You can also place app widgets from third-parties on the apps edge to trigger certain functions. For example, you could place a 1x1 widget from a Twitter app on the edge screen and use it to go directly to the new tweet function, instead of using the app's icon to open it and then navigate to the appropriate page. The edge screen features are a useful edition to the Note family. However, the smooth, curved display can make the device feel somewhat slippery in hand, especially if you're not used to such a curvy phone. And it would have been nice to see some Note- or S-Pen-specific edge features instead of the same exact functionality as the GS7 edge. The Galaxy Note 7 is Samsung's best-looking mobile phone ever. It takes many design cues from the GS7 edge, and from the front it looks much like Samsung's previous generation GS6 edge+. However, the back panel is the real difference maker. The rear side is made entirely of glass, and its sides curve at almost exactly the same angle as the front curved display. A solid metal bezel surrounds the edges. If you close your eyes and rotate the phone, its hard to tell which side is the front and which is the back, until you feel the volume and power buttons on its side, which help determine orientation. Samsung's Note phones have always felt just a bit too boxy and awkward to me, but the Note 7 breaks the mold. Like the Galaxy phones of recent years, its curved design and sleek, sweeping lines make it really grab your eye, as do its shiny, reflective metals. The phone also comes in four colors: the now familiar Samsung "black onyx, "gold platinum," "silver titanium" and a new, flashy "blue coral" option. The Note 7 is the latest smartphone to embrace the new USB C port. That's a good thing, because USB C is the industry standard port of the future, and it offers a number of enhancements, including faster potential data transfer rates and improved charging. But it also means your old micro USB accessories won't work without an adaptor. However, unlike the recent Moto Z Droid Android smartphones that also dropped micro USB for USB C, the Note 7 still has a standard 3.5mm audio jack, in addition to the new charge and sync port. If you compare the Note 7's technical specifications to the last couple generations of Note and Galaxy S phones, you see a slightly disappointing trend: Many of the high-level specs are same. For example, Samsung's displays have always been top of the line, but the company has used the same screens in the last few generations of phones: Quad HD 2560 x 1440 resolution displays. 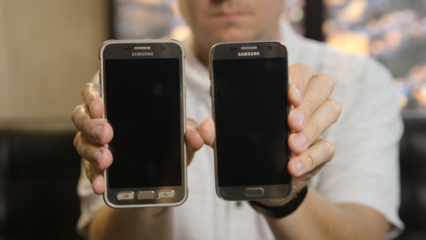 In other words, the Note 5 and GS6 have the same display resolutions and glass tech as the brand new Note 7. That's not necessarily a bad thing, because Samsung screens are still some of the better displays available on mobile phones today. But it's notable. The rear camera on the Note 7 is the same as the GS7 and GS7 shooters, according to Samsung. And the back camera actually has a lower megapixel count than the GS6 and Note 5, though it also has many other lens and camera enhancements that make up for the reduction in pixels. The recent Note phones have been known for better-than-average battery life, due to their big power packs. But the Note 7 has a slightly smaller battery (3,500) than the GS7 edge (3,600). The Note 7 is also thicker than the Note 5, though not by much. The last-generation Note 5 came with either 32GB of 64GB of storage. The GS7 and GS7 edge offered only 32GB, though they both support expandable memory via microSD cards. Like the latest Galaxy S phones, the Note 7 has just one built-in storage option, but it's double the GS7s: 64GB. The new Note also supports external microSD memory cards. For most folks, 64GB should be enough storage space, especially if you use a memory card. But people looking for a 128GB (or higher) option are out of luck. You can learn more about Samsung's new Galaxy Note 7 smartphone on the company's website.